LovingLinks is a website that helps men and women arrange extra-marital affairs. Creating your own profile and browsing profiles on the site is free but you have to ugrade to send messages. LovingLinks.co.uk is a website for discreet extramarital dating in the United Kingdom and elsewhere. Once a member you will be able to locate other attached people seeking a long term or short term relationship, often to bring the romance back into their lives. Signing up is quite fast and easy. That grants access to the site's interactive listings. Though I found the amount of active users to be very low and this turned out to be a disappointment. Many of the profiles looked incomplete or like they hadn't been visited in years. If you aren't able to locate your ideal partner yourself, the site also offers a 1-2-1 personalized matchmaking service. Lovinglinks.co.uk is an outlet for those attached individuals wanting and needing a bit more than they are getting from their current relationship. But to be fair the small number of users makes this tricky. I found the amount of active users to be very low and this turned out to be a disappointment. The majority of members have no intention of leaving their current spouse and are often just looking for companionship and camaraderie. Lovinglinks.co.uk has been featured in a number of media outlets, newspapers, magazines and documentaries. Free basic membership will get you instant access to the site. But unfortunately communicating with other members will require an upgrade to premium membership. Premium members are more prominent on the site since their profiles are highlighted in searches and appear before other members. Given the very small size of the member database, and the limited number of features on the site, the upgrade fee of £85 does seems rather expensive. A better option for those seeking this type of relationship would be Ashley Madison. Rss Feeds. Subscribe to comments for this site. [?] Receive updates about Lovinglinks.co.uk directly through your newsreader. Sorry, just not worth the money. There are hardly any members, the geographical search is a joke and any search will come up with lots of duplicates. Don't waste your money, I wish I hadn't. Beware of the forum on loving Links, it is not moderated and has some dubious poster who can be highly offensive. LovingLinks 2 2 A review of LovingLinks. 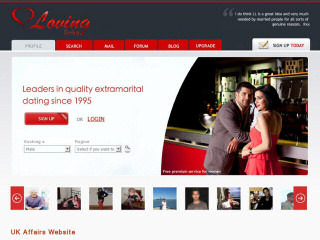 LovingLinks is a website that helps men and women arrange extra-marital affairs. Creating your own profile and browsing profiles on the site is free but you have to ugrade to send messages.